Well-placed plants will bring life, heath and joy into your home. Full disclosure: I don’t have children and I don’t have cats, but man oh man do I have some plants. They’ve been purchased at nurseries and farmer’s markets with my equally plant-obsessed father, brought in from alleyway trashcans and given by friends moving away. They’ve been major investments—a foot-tall Saguaro cactus—and they’ve been grocery store buys after long weeks at work. I’m a plant lover, in part, because they make every room in my home appear more intentional. But mostly, I’m a plant lover because plants make me happy. Unlike a couch, rug, throw or lamp, accessorizing with houseplants brings color, texture, shape, depth and life-giving oxygen to your rooms. Studies show that clean air varieties—ferns, broadleaves and other dark greenery—can produce as much as five to ten milliliters of oxygen per hour. If you’ve shied away from houseplants in the past, take it from a plant lover: you’ve got this. 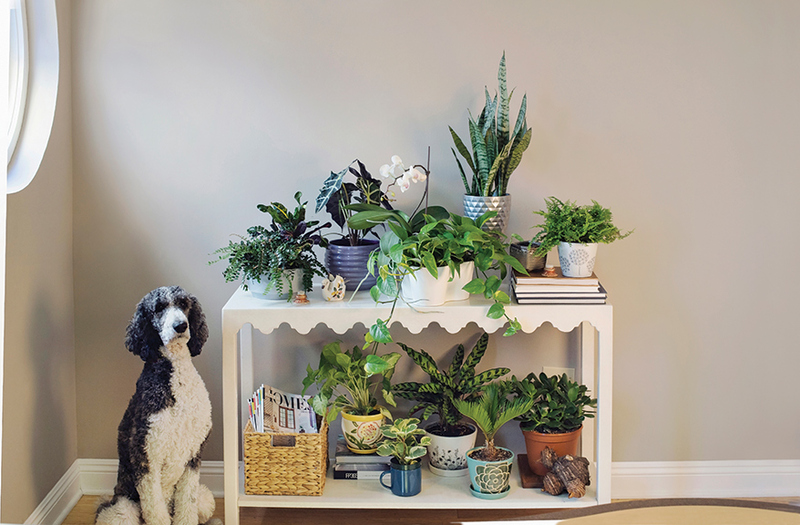 The abundance of inspiration and information available today makes being a plant parent easier than ever before and, as local experts suggest, even a few well-placed plants can bring a little more life, health and happiness into your home.